Either price strength or weakness between the start and end dates for the chosen equity, sector, index or commodity. Results using at least ten years of data tend to be stable for long periods of time, particularly when annual recurring fundamental reasons causing seasonality are unchanged. However, “statistical” slippage can occur. For example, the U.S. high tech sector has a period of seasonal strength from the end of September to a time between the end of December and the end January. On average, the sector peaks between start of the annual Las Vegas consumer electronics show in the second week in January and start of fourth quarter earnings reports near the end of January. Optimal time to own high tech securities for a seasonal trade based on month end statistical data over a 10 year period frequently flips back and forth from the end of December to the end of January. Seasonality studies on equity indices, sectors and commodities need to be re-examined once a year to see if slippage has occurred. Time length for intermediate periods of seasonal strength or weakness ranges from five weeks to seven months. In addition, special short term periods often related to holidays have been identified. Examples include strength just before and after U.S. Thanksgiving and strength from just before Christmas until just after the New Year. Also, longer term “cyclical” periods lasting several years have been identified. Most notable is the four year economic or “presidential” cycle. Data for longer term cyclical periods frequently can be overlaid with annual data to refine seasonal entry and exit points. Most periods of seasonal strength are NOT followed by a periods of seasonal weakness. In most cases, periods of seasonal strength are followed by a period of random performance. Markets moving from a period of seasonal strength to a period of seasonal weakness are rare. Reliability expressed by the number of profitable periods out of at least the past ten periods. Performance relative to a major equity index such as the S&P 500 Index or the TSX Composite Index. A seasonal investment by definition is profitable more than 50% of the time. If frequency of profitable trades is 50% and frequency of unprofitable trades is 50%, results are random. Confidence in a seasonal trade increases with the frequency of profitable trades. A confidence level for a seasonal trade exceeding is 70% is preferred. A confidence level of 80% frequently is available. A confidence level of 90% is relatively rare. A confidence level of 100% is extremely rare. Seasonality happens because of a series of annual recurring events. The job of a seasonality analyst is to examine if the annual events are likely to recur prior to a period of seasonal strength. If annual recurring events are less likely to occur, the seasonality analyst will avoid recommending a seasonal trade. The classic example is a series of recurring events that trigger the annual period of seasonal strength in the equity market. The S&P 500 Composite Index has an historic period of seasonal strength from the end of October to the beginning of May. The strategy is known as the “Buy when it snows, sell when it goes.” Equity markets historically start to move higher near the end of October when the first snowfalls frequently appear. Equity markets tend to reach a seasonal peak around April when last of the snow melts away. Equity markets in developed nations have a similar seasonal pattern. 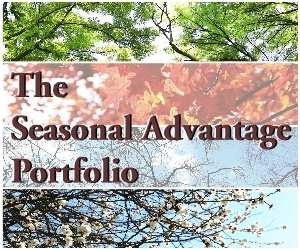 Using seasonality as a “stand alone” tool to make investment decisions is NOT recommended. Seasonality is a useful analytical tool, but only when used in conjunction with fundamental and technical analysis. Trades based on seasonality alone are profitable in say seven or eight times out of 10, but are unprofitable in two or three times out of ten. The same can be said for strategies based on technical analysis. Reliable technical patterns such as head-and-shoulders patterns are accurate approximately 75% of the time. However, they are not accurate 25% of the time. Trades based on fundamental analysis alone also are not recommended. Fundamental analyst picks may be profitable most of the time. However, results from a stock picking contest during 2006 run by a major Canadian newspaper showed that even the best fundamental analysts are far from perfect. The contest requested each participant to choose one stock to buy at the beginning of 2006 and to hold until the end of the year. Participants included a college student, a financial journalist and seven of Canada’s top fundamental analysts. You guessed it! The winner and only person to choose a stock that appreciated in 2006 was the college student. Chances of a choosing a profitable seasonal trade are greatly enhanced if all three methods of analysis are combined. Of equal importance, chances of losing capital are greatly reduced. Technical analysis tells us when to buy and sell. Seasonality analysis tells us what and when to buy and sell. Comments on seasonality made by fundamental analysts can be confirmed by completing a seasonality report based on data for 10 years or more. Fundamental analysts are notorious for commenting on seasonal trends based on 2-5 year data. Ten year studies will confirm or not confirm their comments. A few fundamental analysts on the Street are well aware of long term seasonal trends and base the timing of their recommendations at least partially on seasonality. They usually are analysts who have been in the financial service industry for 10 years or more. Recurring spikes can be examined on monthly price charts using 10 or more years of data. Recurring spikes at the same time each year either on the upside or downside can suggest the possibility of a seasonal trend. Companies and sectors can be examined when they have at least one quarter per year when revenues, earnings, cash flow and/or Earnings Before Interest, Depreciation and Amortization (EBITDA) are seasonally strong. Examples include retail merchandising and consumer electronic companies in the fourth quarter or airline companies in the summer. Seasonal strength in their share price normally begins just prior to their period of seasonal financial strength and ends just prior to the end of their seasonal period of financial strength. Data for 10 years or more can be screened to identify equities and sectors showing periods of above average strength relative to their benchmark index. Preferred benchmarks are the S&P 500 Index for U.S. equities and sectors and the TSX Composite Index for Canadian equities and sectors. One of the greatest myths on the Street is that North American equity markets usually experience a “summer rally”. Traders frequently start talking in May about the possibility of a rally in the stock market in the June to August period. Talk by traders normally escalates during a period when North American equity markets are experiencing a short term correction. The message is “Don’t worry, be happy. The market will come back”. A long term study of the market confirms that a rally lasting three weeks or more inevitably happens during the three month summer period. However, traders fail to mention that the three week rally period has no consistency. Timing of the appearance of the three week rally is random and can appear at any time during the three month period. Of greater importance, traders fail to mention that virtually all three month periods during the year record at least one period of recovery lasting three weeks or more regardless of season. Another myth is the expression “Sell in May and go away”. The myth originated from an actual period of seasonal strength in the base metal sector. Base metal prices as well as base metal equity prices tended to peak early in May and bottom near the end of September. The main reason was the annual operating shut down by base metal smelters in Europe in July and August for Europe’s extended holiday season. Demand by smelters for base metal concentrates slowed in May and recovered in September. Currently, base metal prices continue to show this seasonal pattern, but the pattern has been muted over the years. Market share of base metal smelter capacity in Europe has declined while market share in the Far East and South America has increased. Over the past decade, the “Sell in May and go away” phrase became adopted by the media, but with a slightly different twist. The phrase was transformed into expectation for weakness by broadly based North American equity indices such as the S&P 500 Index and the TSX Composite Index from the end of May to the end of September. The myth is not supported by fact. The S&P 500 Index and the TSX Composite Index has gained in five of the past ten periods from the end of May to the end of September. Unlike the period of seasonal strength by North American equity markets from the end of September to the end of April, performance in the May to September period is random. This period does not have a sufficient number of annual recurring events to influence equity markets. Another myth is that the month of October is a weak and dangerous month for North American equity markets. The myth is based on the fact that substantial downdrafts in North American prices have occurred in the month of October. October 1929 and October 1987 are seared into the minds of traders. However, data during the past ten years suggests that fears of weakness in October no longer are founded. The S&P 500 Index has advanced in five of the past 10 periods and the TSX Composite Index has gained in seven of the past 10 periods. On the contrary! October frequently is the month of the year when important seasonal lows frequently are reached.